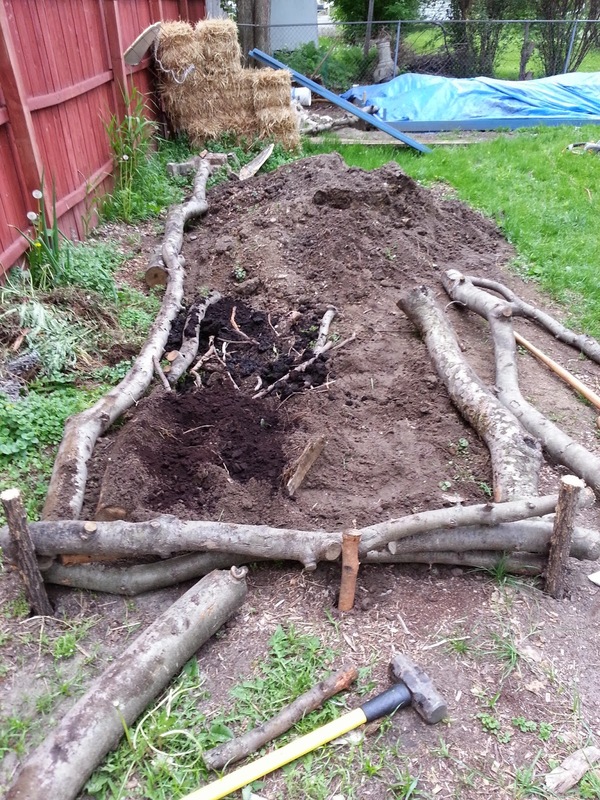 The word Hugelkultur, literally translating to “Mound Culture”, is the gardening practice of using excess wood debris in creating giant raised beds. The woody debris (sticks, twigs, logs, etc.) is placed in the base of the raised beds, acting as a sponge, holding in moisture, creating fungal hyphae and also building soil fertility. I learned about hugelkultur during my permaculture design course. Last year, we had several trees removed from our property along our back fenceline, including an apple, elm and several box elder trees. I asked the tree service to chip all the small branches, but to leave me all the trunks and larger branches with building a hugelkultur bed in mind. The logs have been sitting in the yard since because I didn't have enough dirt to cover them. But after excavating for our chicken coop run, and also excavating for my raised bed paths, I have enough to create a hugelkultur bed. I want to keep the bed moderately in place, so I'm using some of the largest logs to reinforce the sides. And I'm using some of the skinniest logs as stakes to hold it all together. This is just about the opposite of the very square, very level, very precise garden beds we are also building in the back of the yard. Next, I added coffee grounds that I collected this winter on top of the wood. 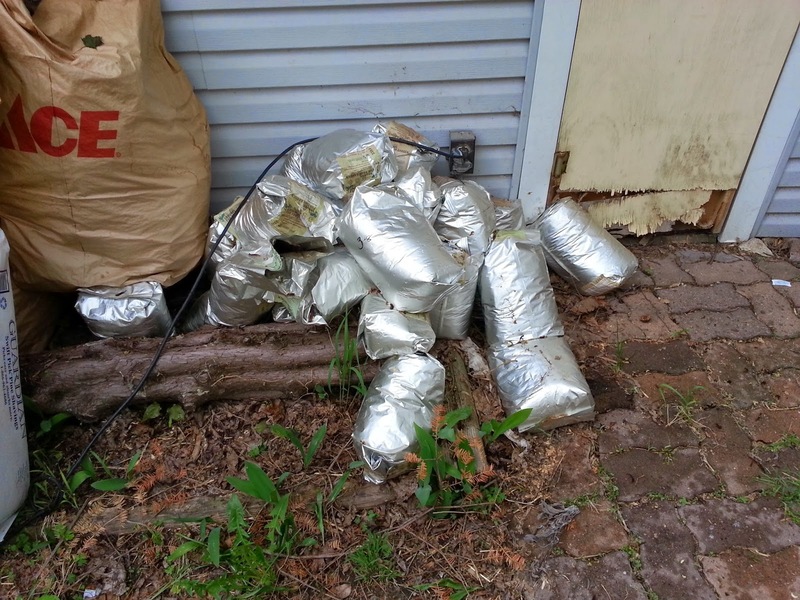 Last spring, I collected coffee grounds from local shops for the big orchard sheet mulching project. Then I discovered that Starbucks gives away five pound bags of espresso grounds. 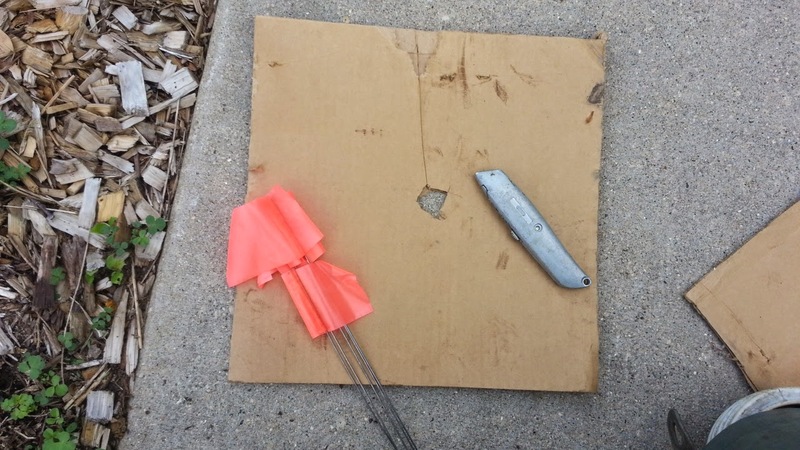 No five-gallon buckets and no paper filters flying around the back yard. Finally, I added soil from a big pile onto the logs. Hugelkultur beds are best when built tall, and having steep sides so the fungi can get enough oxygen. I don't know how much dirt I have yet, but I'll pile it as high as I'm able. I think I have a lot of excavating to do yet from the raised bed paths. The first few years of a hugelkultur bed is its most fertile, so planting heavy feeding plants is best. My plan is to plant asparagus (a heavy feeder) into these beds. 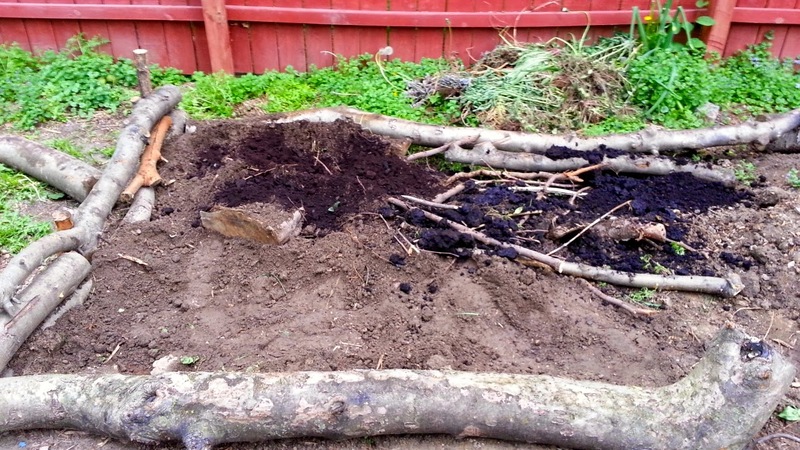 As the wood decomposes, the whole thing will sink and I'll have to add manure (again, asparagus is a heavy feeder). This is a total experiment, we'll see what happens. 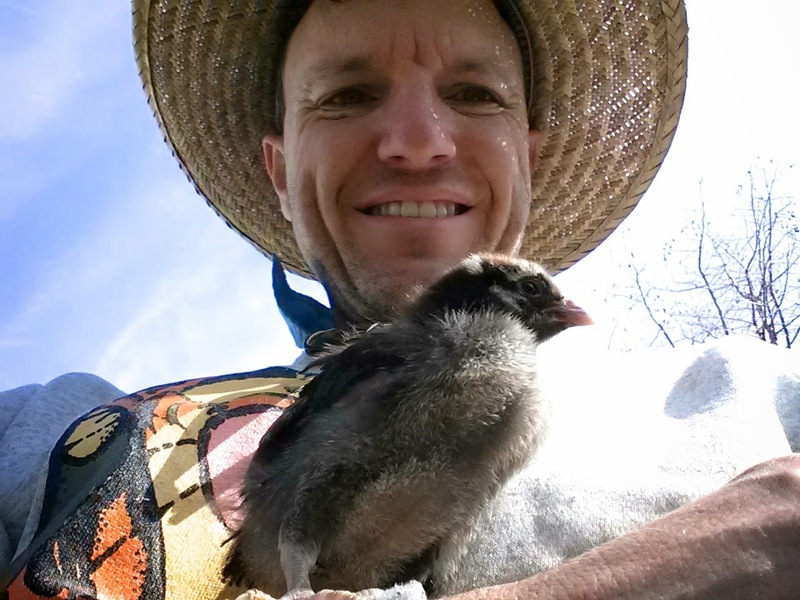 Today's poultry phrase: good egg: a regular guy, good-natured person. One of the biggest complaints about social media such as Facebook and, I would argue, about blogs too, is that the writer shows off his or her best side, best food, best joke, best photo, best everything. It's as if everyone except YOU and ME are having a perfect life. But life isn't perfect, and while I don't expect you've been looking forward to a healthy infusion of schadenfreude (the pleasure derived from seeing others in suffering or trouble), I'd like to share with you a big mistake, the steps leading up to it, and my current dilemma about what to do about it. 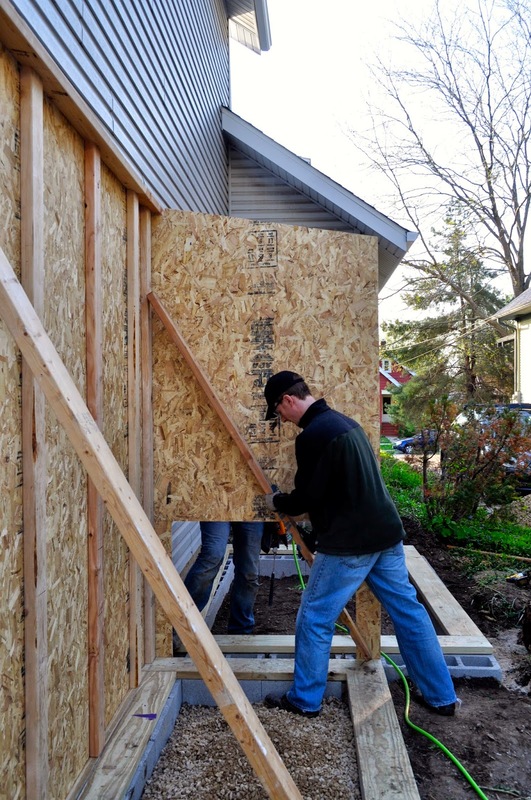 With our front yard firmly established, last autumn Jay and I started to do some long-term planning for our back yard. Among the elements to include were shaded entertaining space, a sunny annual vegetable garden, a shed, compost piles, etc. The north side of our back yard gets a fair amount of sun and is shaded by our neighbor's red maple in the late afternoon (man, it's DARK under one of those!). So we decide there would be enough sun and I started to prepare the soil. 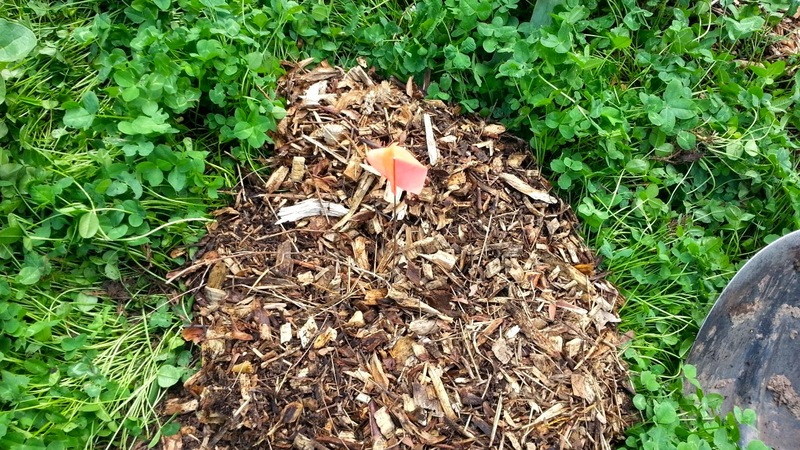 I sheet-mulched it, covered it with a combo of wood chips and coffee grounds and let it compost over the winter. Then late last summer we had an overgrown apple tree and a few other scraggly trees on the fence line removed, which opened up a lot of sky. Early this spring we revisited the plan and noticed a lot of sun in the back yard. So we abandoned the side of the yard spot and went to work on the back. We tilled the soil, dug paths and purchased and painted a lot of wood. That was before all the trees were leafed out. Add to the upcoming disaster our bad judgement of where the summer sun would travel, just how big our neighbor's red maple is, and how much of our back yard it shaded. Weeks went by between our first work weekend and when we next got out to build the beds. We worked a few mornings on the project. We built the beds with painstaking attention to level, and had two yards - CUBIC YARDS I TELL YOU - of gravel delivered for the paths. Then all the trees got their shiny new summer leaves. One afternoon we were working on the garden when, to my horror, I saw a shadow creep up to and over the beds around three in the afternoon. I looked up at that maple, looked down at the shadow. Between this early afternoon shadow (which I hadn't anticipated so early) and a shadow from a tree just on the other side of our back yard fence (which I had anticipated), these sun-loving annuals weren't going to get much more than four hours of full light - not enough to grow a tomato, pepper or an eggplant. I sat down, stunned. I cursed that tree. I cursed my bad planning. I cursed changing my mind from using the side yard to the back of the yard. I cursed wasted time and effort. My only consolation was that we hadn't started to move that gravel, but we still had it, sitting in our driveway. I asked myself, "What the hell are we going to do with two yards of gravel?" So, more to come on this one. But before I wrap up, a poultry phrase that seems apropos for this post. To brood: to be absorbed by negative circumstances. 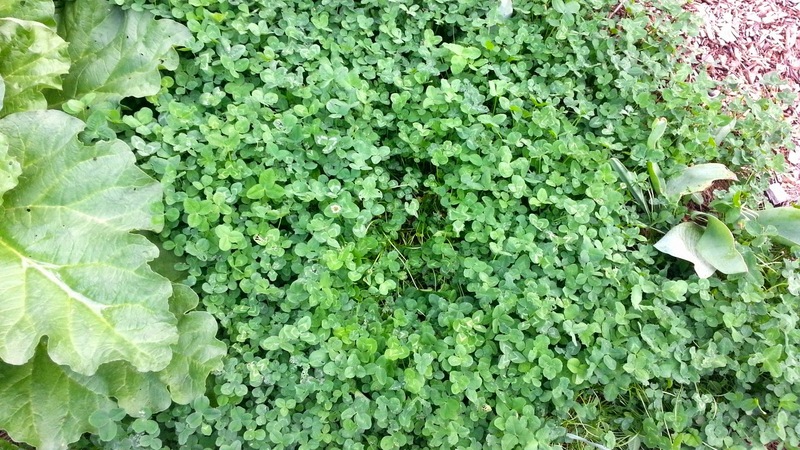 The clover in the front-yard orchard is now well-established and threatening to smother anything shorter than two inches. I purchased two sand cherries and two sea berries and they are not much taller than the clover. I knew it was time to plant them because I could see mosquito larvae swimming in the bucket of water the bushes were sitting in! 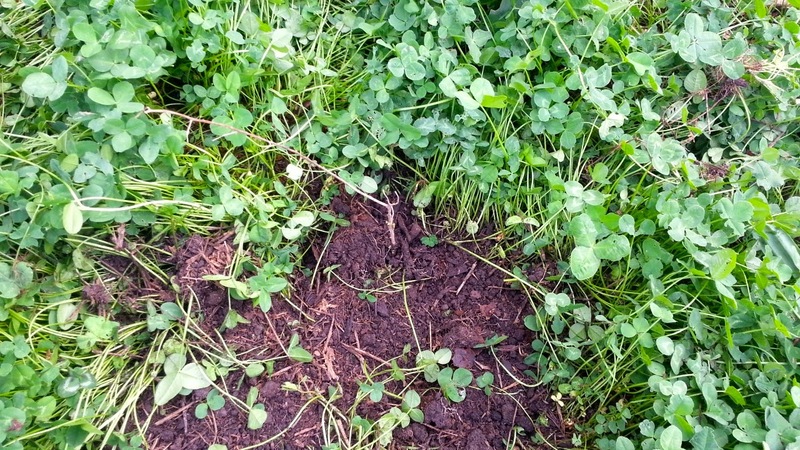 I found some spots for the bushes and dug out the clover, but after planting the small bushes, I realized they were going to get overwhelmed by the clover within a week. That's when I thought back to sheet mulching the front yard. So I found a piece of cardboard (I've always got a stash of it under our back porch) and made little collars for my berry bushes. 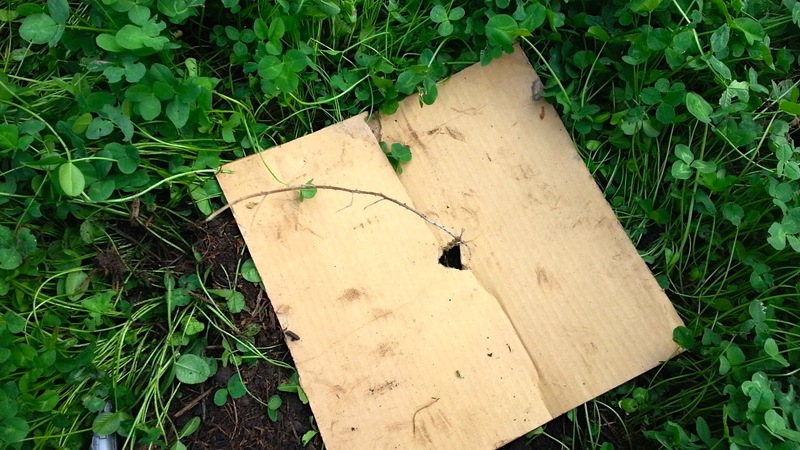 I cut a small hole in the cardboard, and a slit to help get it over the bush's trunk. The bushes are so small, I decided to put an orange flag by each one so I don't forget to water them a bit more often. Here is a sea berry in it's collar, holding the clover back. I added some wood chips and the orange flag, and hopefully this will keep the clover away until the bush gets established. This is a real kick in the pants, but take advantage as you're able. 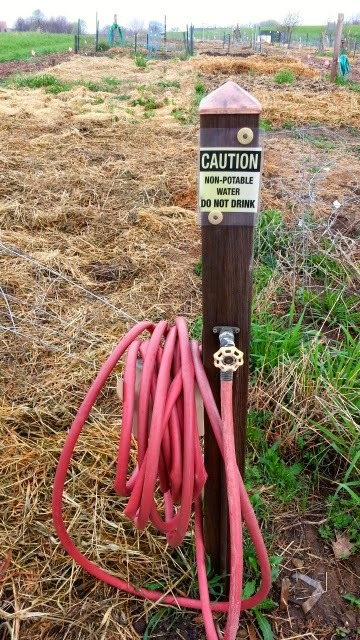 We've used this for years, and used a lot of it in our orchard sheet mulching project. Dane County will be giving away compost by the car and truck load for free over the next several weeks, after recently being notified that municipal partners like the City of Madison won’t be bringing compost material to county sites any longer. 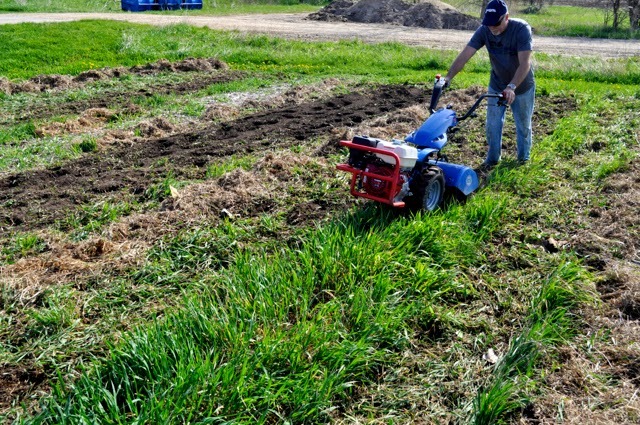 The county compost sites in Verona and Waunakee will stay open until around July 1st to help backyard gardeners and growers get through another growing season. After that, those two sites will be permanently closing. Madison has signed an agreement with a company in DeForest to process all of the leaves and yard waste picked up by the city. 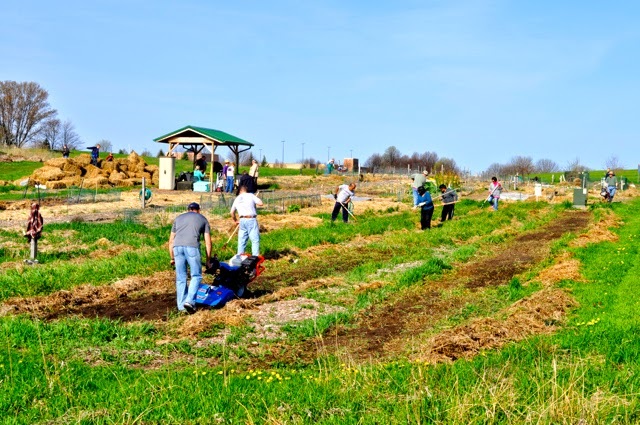 Material from Madison represented nearly 80% of the content that had been brought to the county’s compost sites and converted into compost and mulch. After the compost sites close this summer, residents will still be able to drop off compost at a compost operation at the county’s Rodefeld Landfill (7102 US Highway 12 near Cottage Grove), but compost will no longer be sold. The landfill is also home to the county’s Clean Sweep program. 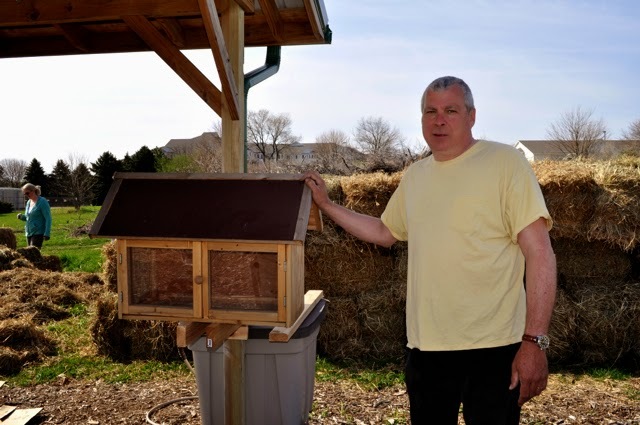 Beginning Friday, May 23rd, the county will offer one load of free compost for residential use per person, per day, at the Verona and Waunakee compost sites through June to exhaust its current stockpile. The Verona and Waunakee compost sites will be open from 7am to 3pm Monday through Friday, and 7am to 11am on Saturday. The sites are closed on Sundays. “While the situation is not ideal, we hope residents will take advantage of our compost giveaway to start this growing season,” County Executive Joe Parisi said. For more information on the compost site closure and the free compost offer, residents are encouraged to call John Welch at 267-8815. 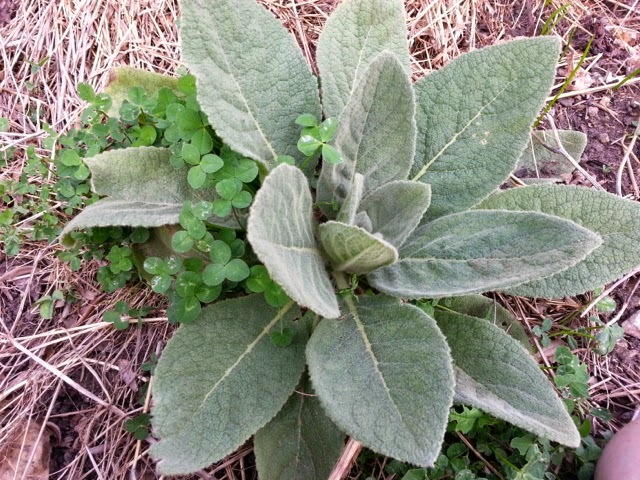 Last year my faithful readers help me identify a couple of plants in my new front yard. I got a couple more for you, and I hope you can help me identify them. I plant the clover, what's the big fuzzy thing? Sorry it's not the best picture, but what's the large leafed plant in the center? So this looks intentional, but what is it? Creeping Charlie. Check. 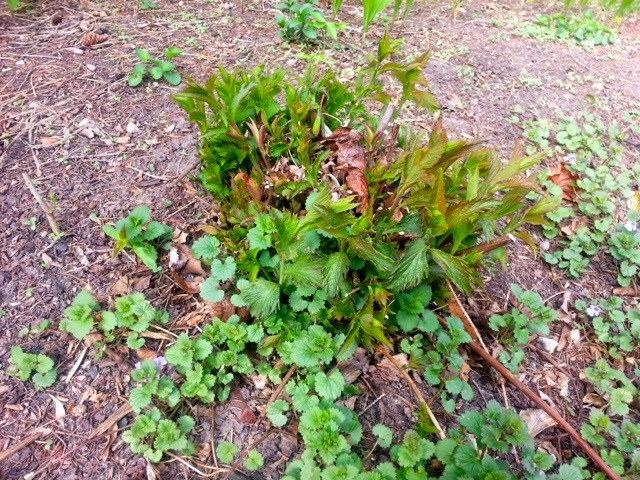 What the thing in the middle that kind of looks like nettles, but I don't think it is? There are many things I like about our community garden. One of my favorite things is workdays, when we rally together and get a lot done in a short time. One of the most impressive times was when 30 people moved 30 cubic yards of wood mulch in about an hour. While we didn't open the 2014 garden with that big a bang, on Saturday I had a great time with my fellow gardeners getting the garden ready for a successful summer. Our primary purpose was to get our weedy community garden patch under control. 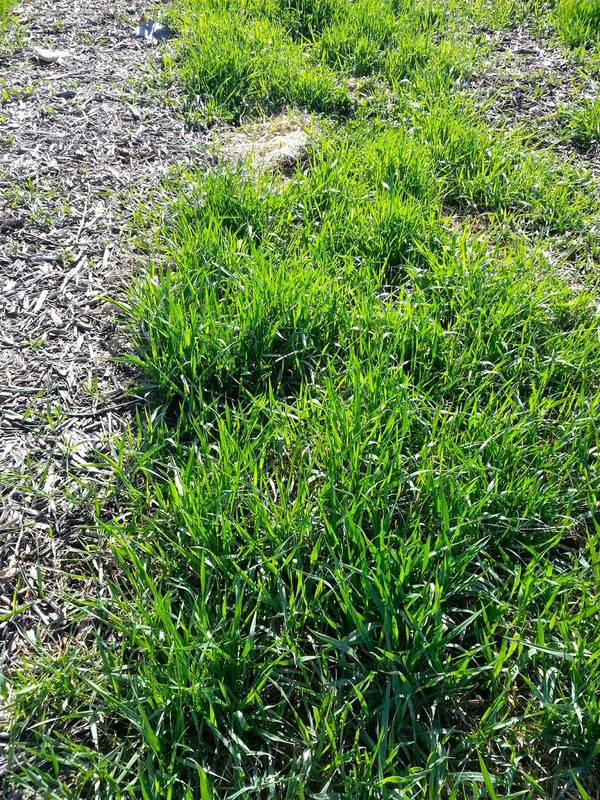 While I don't advocate for repeat rototilling, it seemed like the only way to manage this weed bed was to beat them into submission and then smother them. 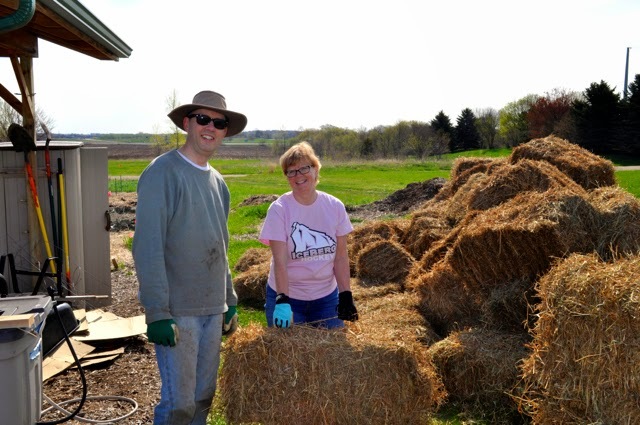 We had a number of people to pull back last year's hay mulch, and then we rototilled the three rows a couple of times. Gardeners then applied a new fresh batch of hay mulch to the newly tilled beds. 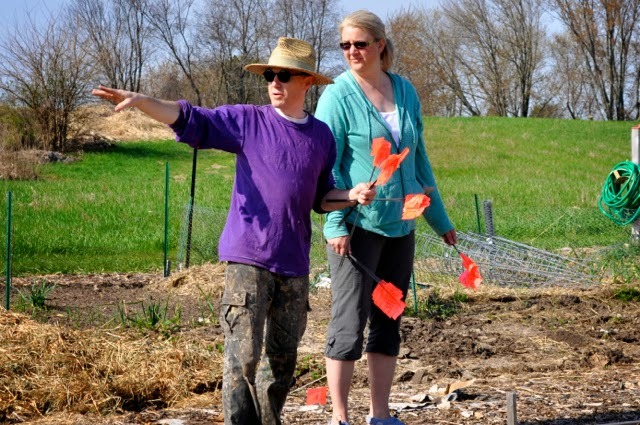 Next week a different group of volunteers is going to plant asparagus and raspberries. I'm still wondering about the wisdom of us releasing that many raspberries on to our garden, but it's what people wanted to do and this area has always been an experiment. I'm game. And I'm particularly excited about the asparagus! At the same time volunteers were hooking our hoses up to the water spigots. It feels like the garden really comes alive when this kind of equipment gets put into place. We also had a load of 100 hay bales for gardeners to use to mulch their gardens. A couple of strong people stacked them up (strings not on the ground) so they'll last until people want to use them. But what I'm most excited about is our little free library. 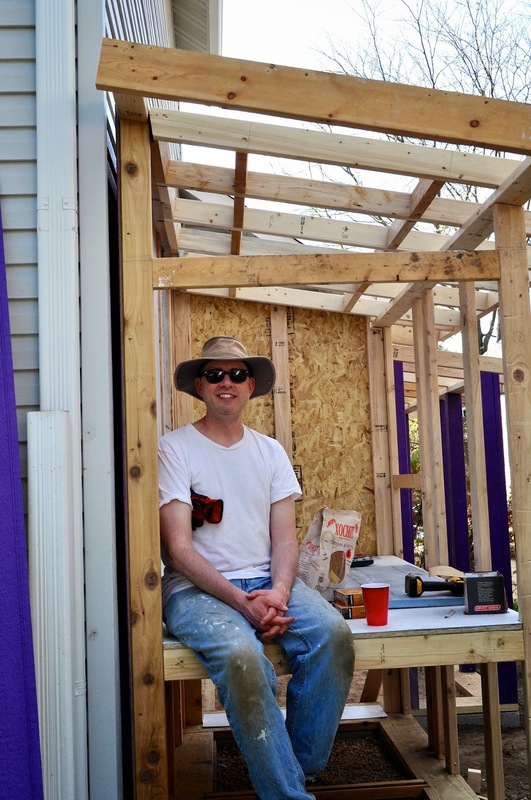 Last year one of our gardeners built this library, and we installed it this weekend. 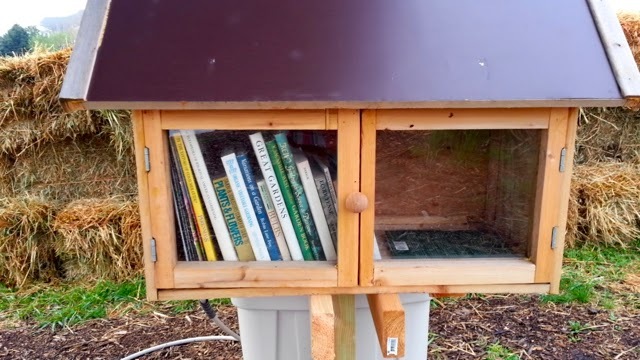 I was happy to add some books my friend Tara had given me, and some of my own gently read copies of Organic Gardening and Urban Farming magazines. Finally, it seems to us that one of the perennial challenges is figuring out who actually is using their gardens even after they signed up for a plot. It seems like every year a couple of people sign up and pay for a plot, but the never get into the garden. 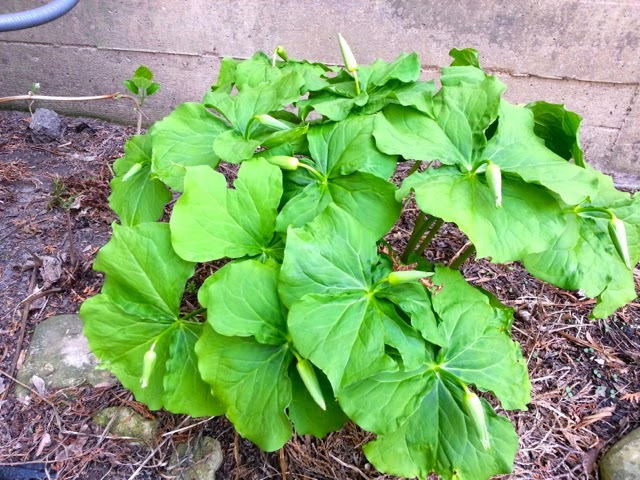 We don't discover this until June 15 when it's weedy and pretty much past time that another gardener could use the plot, or we could dedicated to food pantry production. 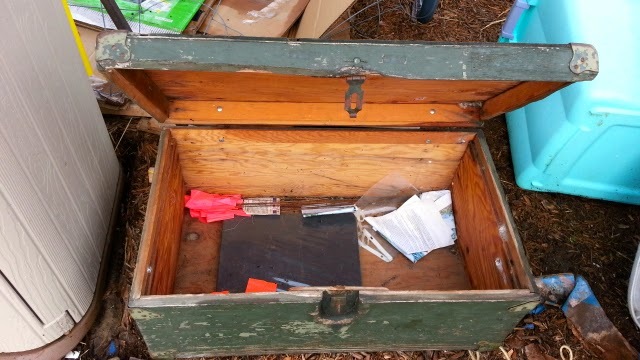 This year we put numbered flags in each plot, and are asking the gardeners to remove the flag and put it into this box to both help them find their plot and indicate that they are actively using it. I understand that for some people things come up and they simply can't garden. But maybe this way we'll find earlier those people who never even tried. If you're interested in learning how to prepare and preserve spring produce and other food, the Goodman Community Center is offering seven Tuesday evening classes from early May to mid June. I'm thinking about attending the chips and tomatoes classes. Register by email to amymach@goodmancenter.org or call Amy at 241-1574, ext. 227. In our community garden, we have a weed problem. Actually, we have three of them, and each is 130 feet long and five feet wide. These were our community vine patch that over a two years has produced many many pumpkins, squash and cucumbers. 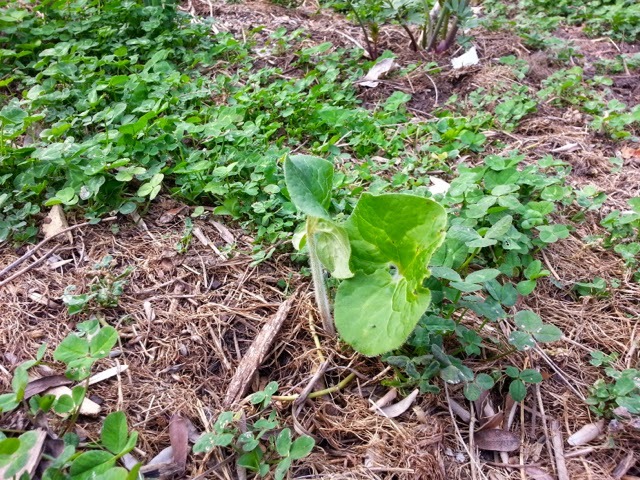 But interest in it has waned as the squash beetles destroyed many plants. So this year we are converting the three long beds to perennials; asparagus and black berries. We may rethink the wisdom of the latter, but for now, it seems better than fighting those squash beetles. The long rows where we'll plant our new perennial crops are a weedy mess. Our community garden is organic, so no Roundup. 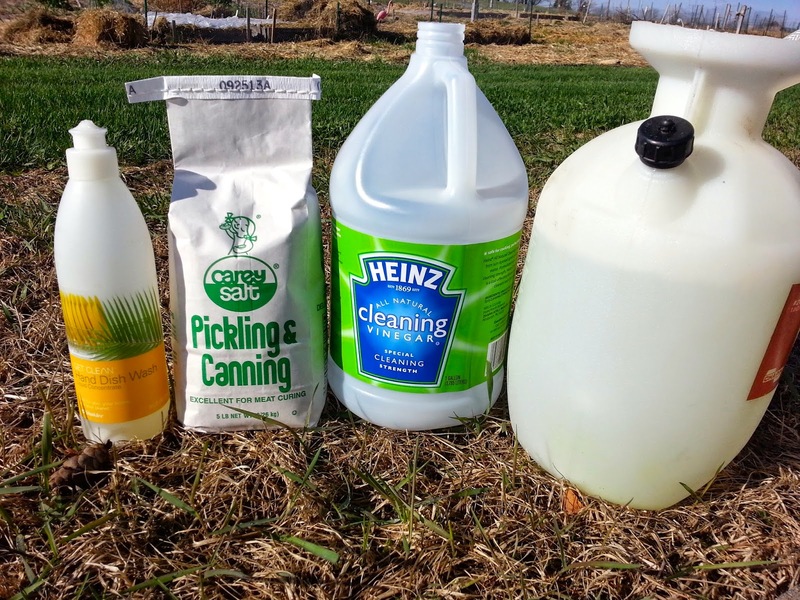 I found a recipe online for a gallon of vinegar, a half cup of salt and a tablespoon of dish detergent to kill weeds. My first reaction was if this really worked, everyone would be using it. Then I thought that Monsanto sells Roundup, not vinegar, so maybe it does work but doesn't get much press. At the grocery store, I found a special "cleaning" strength vinegar, 6 percent vs. 5. Most recipes said the 5 percent would work, but what the heck, for a buck more a gallon, I bought the stronger stuff. The recipe says that the vinegar solution needs to be put on plants on a sunny day, because it's the vinegar + sun that fries the leaves. 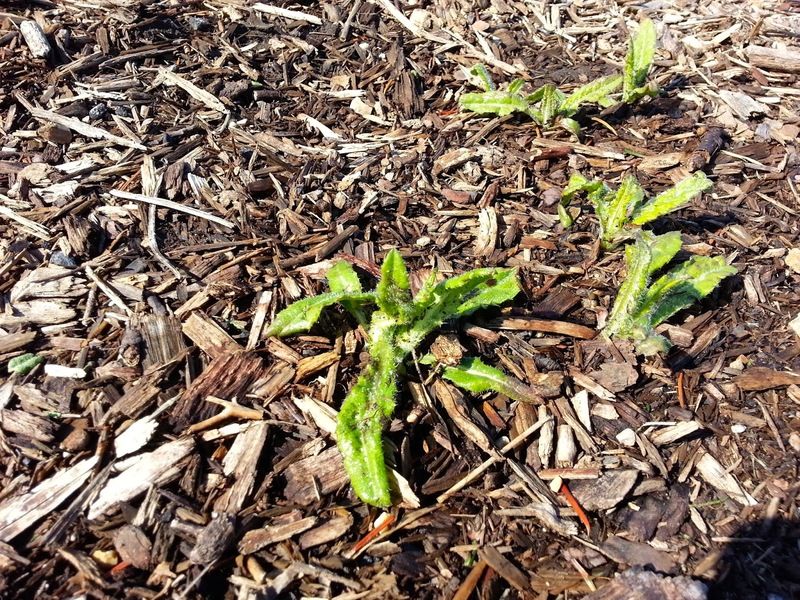 In addition to hitting the grassy beds, I also spot treated thistles coming through our paths. My theory: hit them when they are young, and hit them several times, and maybe we can kill them. 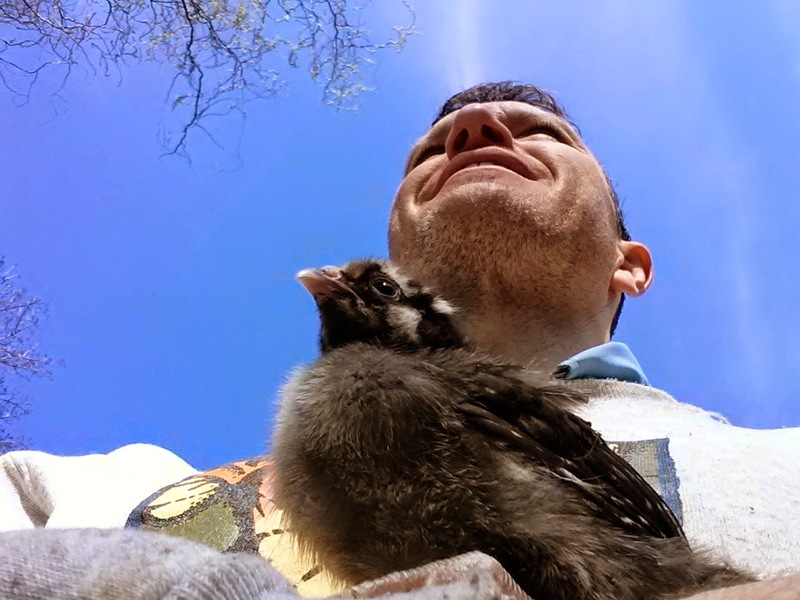 A few photos of my (fairly) tame chick, who I take for a walk with me almost every day. This is a "felfie," aka a "farm selfie" with Olive. See more about felfies. Olive and I looking toward a bright future together. A little video of Olive and I. Her peeps at the end are my favorite. 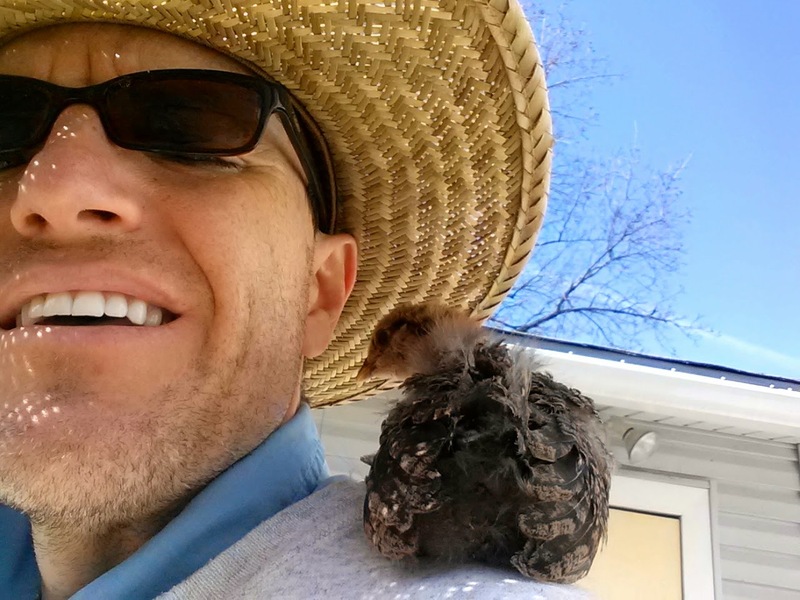 Betsy Ross insisted on sitting on my shoulder during our walk. Madison's annual rain barrel and compost bin sale is Saturday, May 3. This year they are offering a modular rain barrel (really, it's a cube looking thing). I've been to the sale before, get their early. I mean, really early, not only to avoid the line but not to be disappointed after waiting to not get what you want. They sell out! Saturday, May 3, 10 a.m. - 2 p.m.